At 6’10” Martin Bayfield, an ex-policeman, was one of the tallest players in rugby- a stat he used to full advantage as one of England’s most potent forwards. On the field Martin enjoyed a successful international career, winning 31 England caps and two Grand Slams as well as being selected to represent the British Lions in New Zealand. Since retirement Martin Bayfield has moved seamlessly into broadcasting – commentating for the BBC and Radio 5 Live, hosting Five’s NFL coverage as well as The World’s Strongest Man and most recently covering the Rugby World Cup 2011 for ITV. In March 2012, Martin Bayfield was confirmed as a regular presenter on BBC1’s long-running Crimewatch, thus cementing his reputation as an accomplished and trusted studio presenter. Possibly Martin’s most famous achievement to date is his involvement in the Harry Potter films, where he played Robbie Coltrane’s body double as the giant Rubeus Hagrid. A role in BBC1’s much-loved series New Tricks followed and 2012 sees another exciting development in Martin’s burgeoning media career, more details to follow soon! 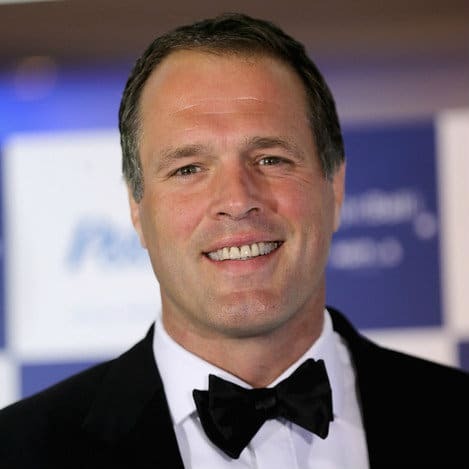 Although injury prematurely ended Martin Bayfield’s rugby playing career, his charismatic personality and natural flair for commanding a room led him to take centre-stage at corporate events and prestigious functions. Martin is now a popular after-dinner speaker, MC and auctioneer, famed for his exceptionally funny speeches. He is now in huge demand for a range of corporate events including gala and sports dinners, award ceremonies, company conferences and away-days.